Everything you need to know, all in one place. Colors for Documents, Text, Graphic Objects, Etc. Working together with colleagues and editors is an integral part of the writing process and it has to run smoothly, no matter if your colleagues use another program, for example MS Word. Alternatively, you can drag a document and drop it into Papyrus with your mouse, which will open it in a new tab. 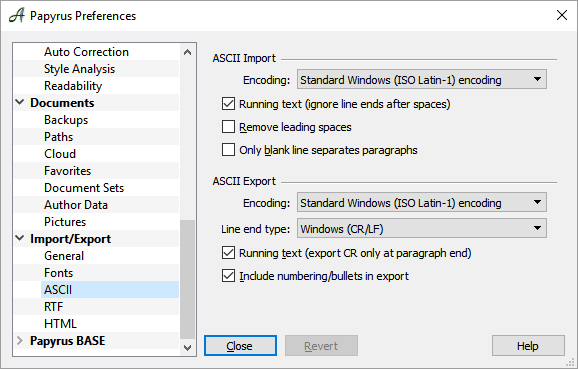 Our reference for the import/export function is MS Word, in all its varieties. Your style templates, text and page layout, tables and even revision tracking, will all “come with” when you import/export your document. We have also optimized the import and export of other “doc” documents, like OpenOffice / LibreOffice for example. Though, of course, only up to the point that the compatibility with MS Word is not impaired. Papyrus offers many features that Word does not, so it’s important to save your day-to-day work in the Papyrus format. Otherwise you will lose important data, such as your clipboard, Navigator, character connections, etc. The “*.doc” format shouldn’t be used as your working format, but only for exchanging documents with MS-Word users or other compatible programs. In order to exchange documents with other programs, such as Adobe InDesign, Papyrus can also handle the ASCII formats (“txt” etc.) as well as “rtf” (see the “ASCII” Settings ). In Papyrus, with a font size of “12,” “one-and-a-half spaced” is .67″, “double spaced” is .90″ and “single spaced” is .45“. In this dialog you can choose how other file formats should be handled and how they should appear in the file selection dialog: should they be converted to the Papyrus format (*.pap) or should they be left in the native DOC, DOCX, RTF, HTML, or ASCII formats? 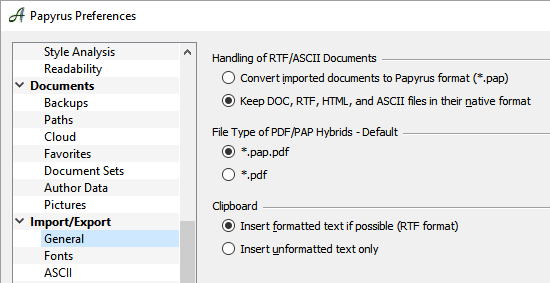 For PAP/PDF hybrids you can choose which file type ending should be used as default (content and usability of the file with a PAP part and PDF readability will not be influenced). Then there is the clipboard setting that influences copy / paste functions between programs. Here you can choose whether Papyrus should insert formatted RTF or Unicode text if possible (our recommendation), or whether you would rather have only unformatted text (ASCII format), which is a setting you can use if formatting problems occur when you copy and paste. When you find that import or export results are different to your expectations, you can try setting “Use alternative filter for DOC” for either import or export. This will use a second engine to load or save DOC and Docx files and can yield different, possibly more fitting, results. For most cases, the default filter is better-suited. There is also an option to determine how your graphics will be displayed in RTF / DOC format. We recommend that you use the slimmer binary format when you know that your text recipient will be able to read your RTF and DOC texts with binary pictures without any problems. Otherwise, use the hex encoding. Under “Encoding” you can set the “code page,” which is a table of values used by an operating system to read the letters and numbers in your text. This is a good idea if, for example, you want to save a text for a UNIX computer and intend to open it with a program that can only understand UNIX ASCII text. © 2019 Papyrus Author, Inc.